It's already mid-November and I haven't even written about the end of October! Time is flying by. 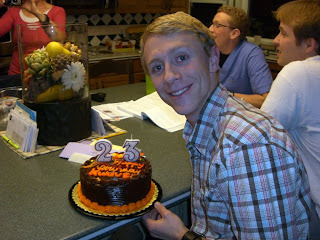 Kevin turned 23 on Oct 22. We both took the day off work to hang out. He still had school though. He had one class in the morning and one in the evening. 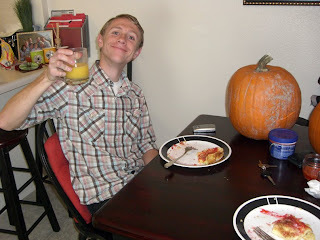 I made him breakfast, German pancakes (our favorite! ), before he had to go to class. Then when he got home, I had a surprise for him. We rode Trax up to Salt Lake and the whole time he has no idea where we are going. Then we get off and walk a block or so, and he figures out that I'm taking him to the Body Worlds exhibit. He was so excited! It was so cool! Our bodies are so amazing! So that was fun. 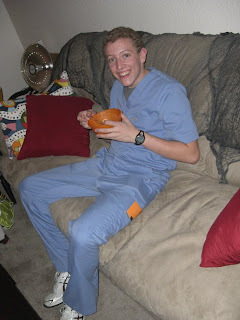 Then we came home and had dinner and he went off to class again. 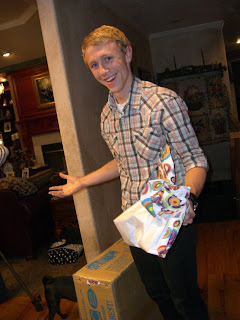 That night, we went to his parents' house to open gifts. I got him a bicycle trainer. 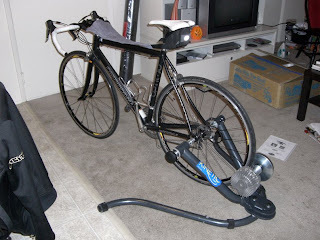 It's a piece of equipment you hook your bike up to and it pretty much turns it into a stationary bike so you can still train during the winter. I got it for him about the beginning of September and he had NO IDEA. his parents and mine both went in on it. He started asking his parents for one about two weeks before his birthday and found one online that he liked and so his parents ended up having to trick him into thinking they had ordered it for him, but it wouldn't be delivered for another couple weeks... In reality, the one i got him was waaaay nicer, and usually double the cost, and already wrapped up as a gift :) I got a great deal on it too, half off! So, needless to say, when he finally opened his gift, he was shocked and SO excited! It was awesome! He went home that night and put it all together. It takes up half our living room, but its OK :) I love him so much and hope that he had a great birthday! He is the BEST! Cake that night at his parents' house, before he opened his gifts. The trainer all hooked up back at home. 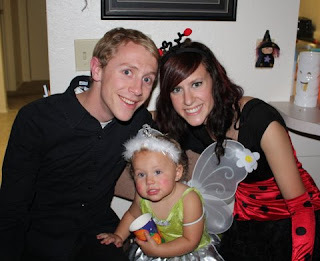 On Oct 25th, Kevin and I had a Halloween/birthday party for our families. 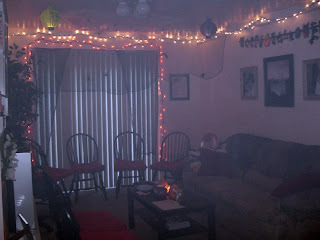 We had our apartment so decked out with decorations. We even had a fog machine! 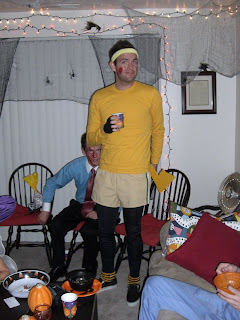 We had a costume contest, so everyone dressed up. 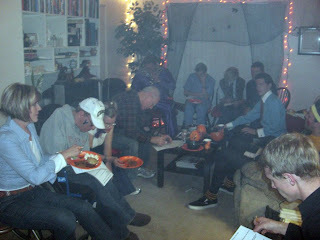 We had food and a Halloween quiz/game, music, and a lot of fun! Everyone really enjoyed themselves. Kevin and I are so glad that our families like to hang out together! We had dinner too. Pumpkin soup, veggies, rolls, pumpkin cookies, spice cupcakes, white chocolate popcorn, root beer with dry ice. It was way fun. I was worried it would be horribly cramped fitting all those people in our little apartment, but it wasn't that bad. We just might have to do it again next year! Me showing the food table before the party. 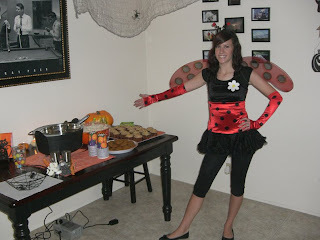 I was a ladybug. Everyone taking their Halloween trivia quiz. It looks a little foggy because of the fog machine. 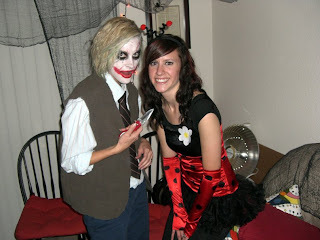 Chantelle was the Joker and it turned out AWESOME! Everyone loved it! Look how creepy she is! 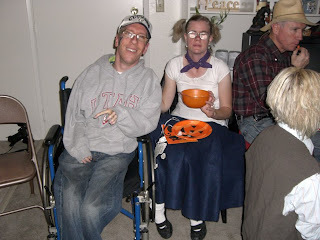 She won overall best costume. 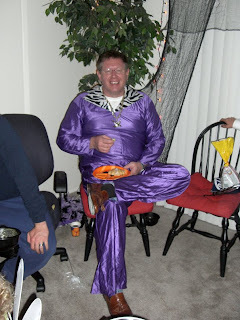 My dad was a pimp, haha! He was voted funniest costume. 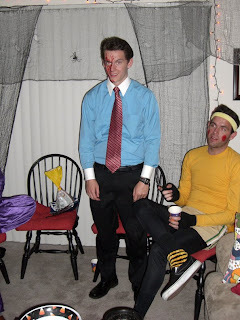 Logan was Patrick Bateman from the movie, American Psycho. His was REALLY cool too. He had on a clear, plastic poncho/jacket splattered with blood but took it off because it was messy. Colby was Pikachu haha! He got voted most original costume. 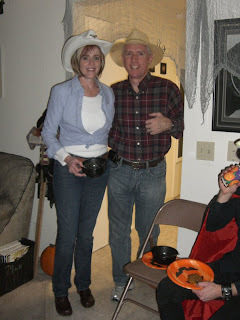 Jeannine and Chad, cowgirl and cowboy. 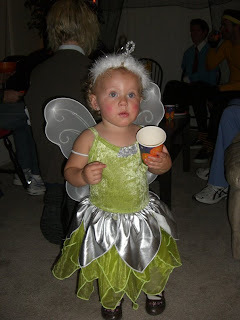 Riley was Tinkerbell. She was so adorable! She was so addicted to the white chocolate popcorn I made. Tyler and Tara. Tyler was a half BYU fan and half Uof U fan (a joke since my family are cougar fans, and Kevin's family is all for the Utes). Tara was a cute 50's girl with a poodle skirt. 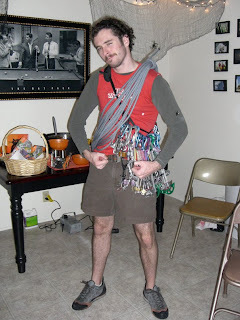 Brett was a climber, so pretty much himself! 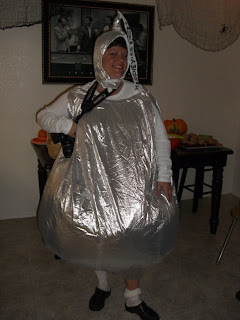 My mom was a Hershey's Kiss! 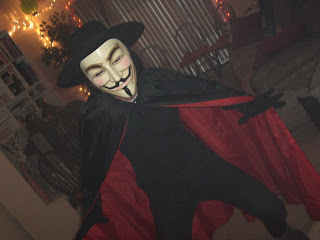 Kevin was "V" from the movie, V For Vendetta. I didn't get a picture of Dave or Brianna because they came later, but Brianna was a cat, and Dave a a scary Ghost/Monster/Grim reaper thing. He won scariest costume. It was impressive! !